Meenu Yadav, a resident of Firozabad, Uttar Pradesh, was on a train to Gwalior from Jhansi when she met Gautam, a former client of Eyeway. Gautam, who is a visually impaired teacher at a government school in Jhansi, came to know about Tanya Yadav through his conversation with Meenu. 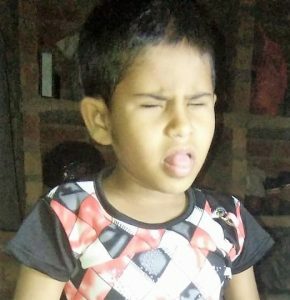 Tanya is Meenu’s 7 year old daughter who is blind and speech impaired by birth. Moved by her circumstances, Gautam was told her about Eyeway and its services for the blind as he recalled his own positive engagement with Eyeway. In August 2018, Meenu connected to the Eyeway Helpdesk and shared her experience of raising her visually impaired daughter. Kidney failure contracted by her during gestation affected the foetus which resulted in Tanya’s vision loss and speech impairment. The parents sought Tanya’s cure for long at many hospitals but their efforts were in vain. Tanya’s father is a software engineer and her mother, a homemaker and they also have a 10-year-old son. Lack of proper guidance was their problem due to which Meenu struggled with her daughter’s day-to-day needs for mobility and independence. This also left her worried about Tanya’s future. When she connected with Eyeway for the first time, she wanted to know about various education opportunities for Tanya. She believed that education could change her life and instil a new beginning to an otherwise heavily dependent life. On comprehending Meenu’s concerns for her daughter, the Eyeway counselor had to take a well-thought-out decision given the dual disabilities the child was suffering from and then provide with the appropriate options for her empowerment. Eyeway counselor gave her the options of sending Tanya to SENSE International in Ahmedabad or Helen Keller Institute for Deaf and Blind in Mumbai which are both organisations that work for people with multiple disabilities. Due to the lack of hostel facilities at SENSE International, they chose the Helen Keller Institute where they impart education to children between 7 to 18 years who have multiple disabilities along with visual impairment. Tanya being 7 years old can make use of this facility where special educators will instruct and teach her. The activities and curriculum are individually modified to suit each child’s developmental and cognitive level. Functional development like personal hygiene, daily living activities, mobility, community outing, money management, etc. are all also taught to them. Academically depending on the capability of each child, a modified curriculum is taught for each subject and computer education is an integral part of academics.At Helen Keller Institute, Tanya will be provided accommodation and around-the-clock care till she can be on her own. Heeding the counselor’s advice, Meenu promised to enrol Tanya at the earliest.